I continue to progress slowly on unraveling the mystery of what happened to Goldie (White) Cruvant and her two children. 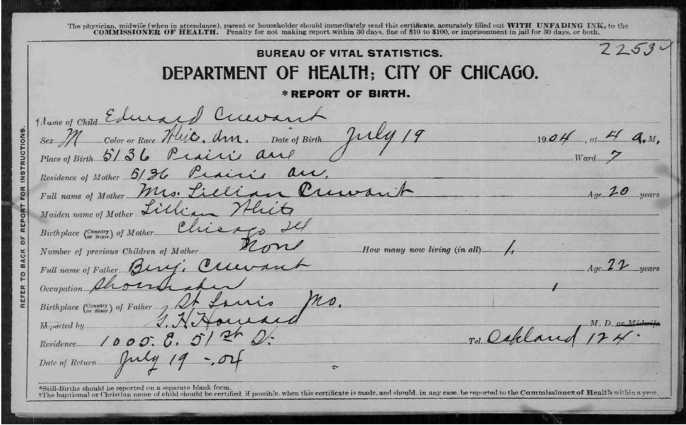 My great grandmother's brother, Benjamin Cruvant, married Goldian Lillian White in Chicago, IL May 26, 1904. They had a son, Edward (Clifford Paul), July 19, 1904, and a daughter, Goldie (Sarah M), July 22, 1905. When Ben returned home to St. Louis with his family in 1907 all heck broke loose. Goldie wasn't Jewish, and Ben's parents weren't pleased. Goldie Lillian and her two children returned to Chicago, and Ben ultimately remarried and had two more kids. What became of Goldie and her two children are somewhat of a mystery, one a cousin and I have been trying to solve. She started the search over a decade ago, and I started helping a few years ago. changing "Edward" to "Clifford Paul"
The love of a blue-eyed baby girl is awaiting the return of Benjamin Cruvant, who left his home in East St. Louis two months ago. His 2-year-old daughter is worried over his absence and in her baby prattle she daily calls for her “dada,” whose absence she cannot understand. 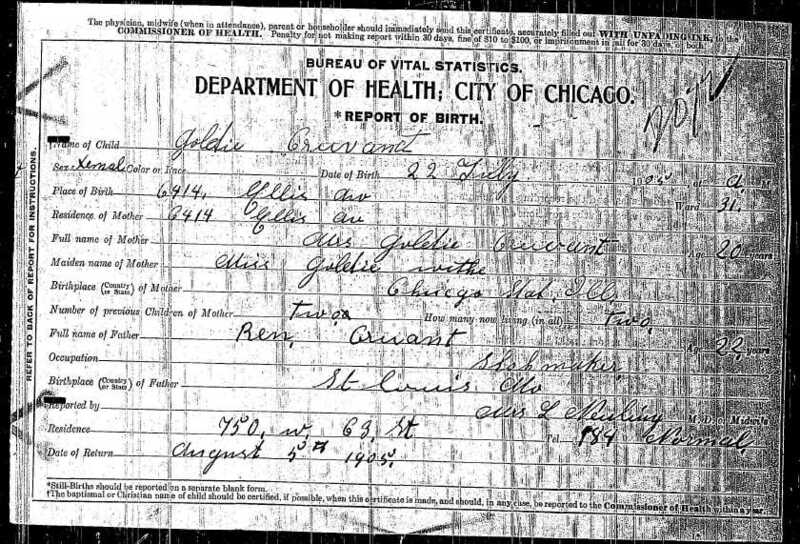 The resolution of the drama isn't completely clear, but in 1910 Goldian Lillian and her two children Clifford E. and Sarah M. are in the Chicago census. Goldian is listed as 'widowed,' which was common for divorced women at the time. The age of "Sarah M." is appropriate for the daughter. I found an issue of the Typographical Journal indicating in 1914 Mrs. G. L. Cruvant applied for union membership in Denver, Colorado. However, we've been unsuccessful in finding the three of them in the 1920 or 1930 census. I know the Certificate of Correction for Clifford Paul's name was filed between 1934 and 1950, and at the time Clifford and his mother were both alive. At some point I will request from the Chicago Records department the exact date of that correction. Unfortunately, the Family History Center microfilm record cut off the date. The only way I know it is between 1934 and 1950 is due to the name of the Deputy Clerk. Of course...when the 1940 census was indexed...one of the first things I did was search for the more unique surnames in my tree, including Cruvant and its various different spellings. Mary Cruvand, age 36, born in Illinois, living in Miami Beach, Dade, Florida, divorced, a housekeeper. Sarah's middle initial on the 1910 census was M, and neither my cousin nor I are aware of anyone else named Mary who was either born a Cruvant, or married one. It's a rather unusual surname making it much easier to narrow down the possibilities. Three years later Mary M. Cruvand appears in Ancestry's Florida Marriage Collection, marrying a Sam P. Bieber in Dade. All the record provides is the certificate number, which I will have to order to find more information. It is possible this is the same Samuel Bieber who was born Nov 12, 1898 in St. Louis, was in Chicago by the 1910 census, and passed away on Jan 4, 1950 in Chicago. If so, he is buried in Section 37 of Waldheim Cemetery, perhaps not too far from my maternal great grandparents. I have contacted the cemetery to see if Mary is perhaps buried next to him. I haven't found either Goldian Lillian or Clifford Paul in the 1940 census.